Context is far MORE IMPORTANT than the trade entry trigger. One of the dangers that newer traders face is too much obsession with Lower Timeframe or Trading Timeframe entry trigger patterns. I've been there myself. We all seem to get stuck there. Entry trigger patterns are exciting. They're simple to see. And most importantly, they satisfy our "need" for certainty. And so when I post a trade with a shooting star trigger entry, or a spike & ledge, or a spring or upthrust, I get people emailing me with a dozen examples of these same trigger entry patterns that they've just found on a chart. But typically…. they're forgetting context. Never forget context. It comes first! What do I mean by context? Context means the surrounding conditions or circumstances within which the trade is occurring. There are many ways to look at context. 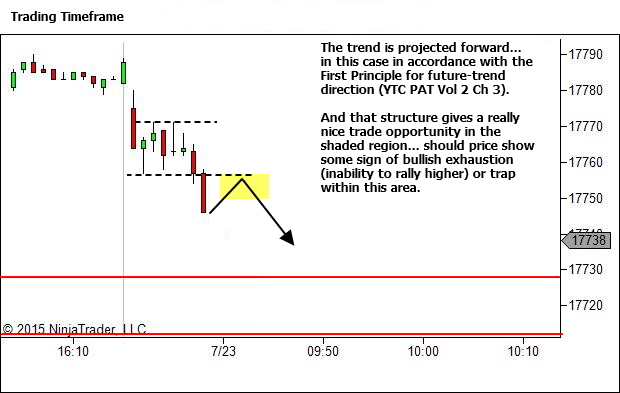 My preference is to consider where the trade is occurring within the Higher Timeframe S/R framework and the Trading Timeframe trend structure, plus whether or not the "behaviour of price movement" matches my future-trend projection (See YTC Price Action Trader Vol 2 Chapter 3 for the Principles of Future-Trend Direction!). There are other ways. Some traders gain a feel for context through market profile, or intermarket correlations, or… well there are many ways. The point is simply that a trade does not occur in isolation from the surrounding market conditions. And those conditions are important. As you can see… it's a really nice Shooting Star pattern. But that's not the important part. Let's look instead to see the conditions surrounding the trade. 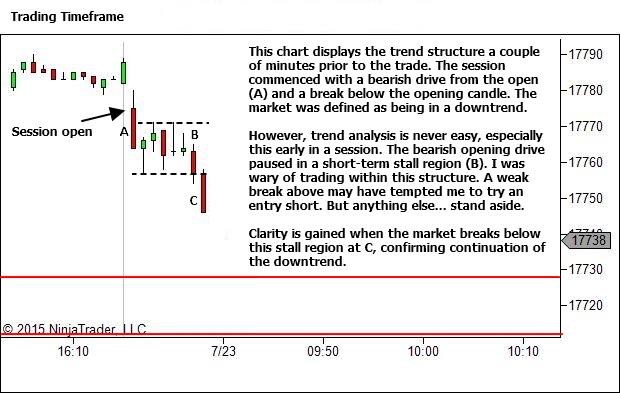 Always maintain awareness for where the trade is occurring within the Higher Timeframe S/R structure. Is the market currently within the area of influence of a Higher Timeframe S/R level? If so, then our Trading Timeframe trend and bias analysis MUST consider this fact. Is the nature of price movement suggesting a break of the level? Or is it more likely to hold? How will this influence other traders decision making? Where might they get trapped? What will price need to look like to indicate a trade opportunity? And, if the market is well clear of S/R levels, then we simply maintain some awareness in the back of our mind for how far we have available to run till we do hit the next S/R level. 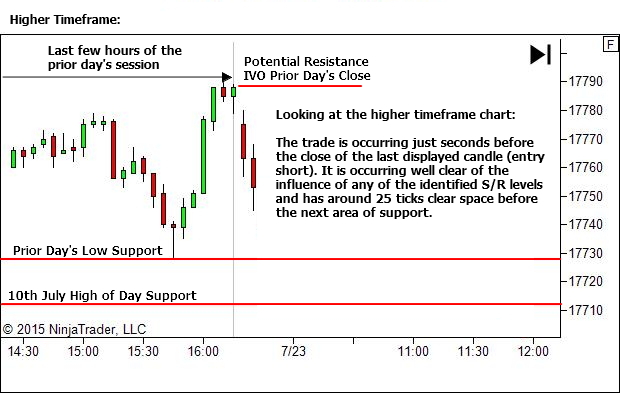 In the case of this trade, we're currently positioned (pre-entry) well above the next level of "prior day's low" support. Let's look at the Trading Timeframe trend structure in the lead-up to the trade. 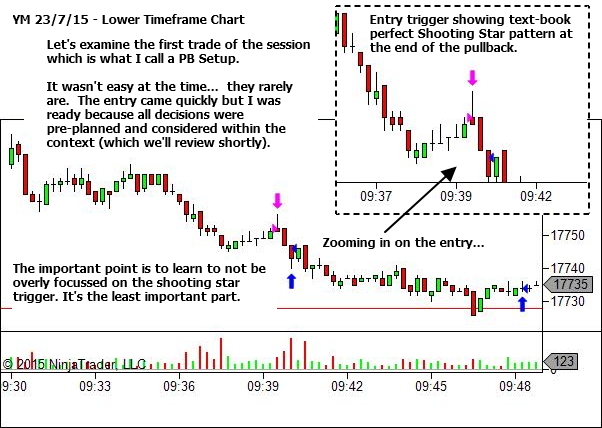 Don't look at my work or someone else's and see a Shooting Star pattern and think that this is the key to good trading. 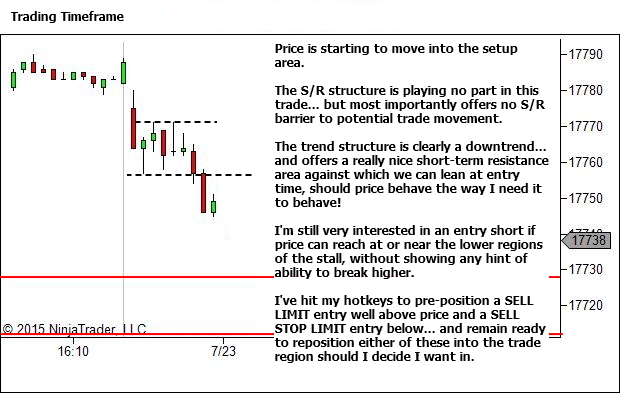 The important part is everything surrounding this trigger pattern – where the trade is occurring within the S/R structure – where the trade is occurring within the trend structure – and consideration for the way price is moving as it enters your setup region. Let's look at the outcome. 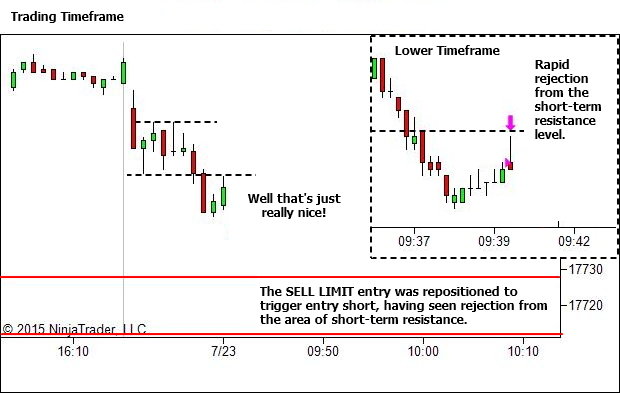 Don't get caught up in looking for pattern-based entry triggers. Much more important than this is the context within which they occur. Learn to look for CONTEXT! It's one of the keys to successful trading. Great article, I believe there is value in reviewing this pre session. Great article Lance, thank you. So your sell order was matched by a ‘profit taking’ buy order and not necessarily a late buyer into resistance? Great question. Yeah, this is absolutely possible. The reality is that when talking about the buying or selling occurring at any one location at any particular time, we don’t know who really comprises that buying or selling, nor whether they’re doing so to enter a position or close one out. For all we know it could be a bunch of fundamental traders submitting orders for reasons completely unrelated to any chart patterns. It could be a daily chart trader taking a position that is expected to be in play for several days, again for reasons completely unrelated to our little 1 minute chart. So yes, the buying in this case could be earlier shorts covering their position and taking profits. But they’re doing so in a location that is unlikely to generate widespread bullish sentiment. So like the newbie who would enter late and trap themselves in a low probability trade, these shorts who cover will find themselves trapped OUT of their profitable trade as it again continues lower. Hopefully, some of them will regret their exit decision and re-enter; their orderflow again helping push our trade to profit. So whether it’s newbies entering long, or an earlier short closing out a position, that’s fine. They’re doing so in an area where I don’t think the market can go higher. That’s where I want to trade. If it’s newbies… their exit will definitely help me. And if it’s shorts covering, hopefully some of them will re-enter. Either way, that’s cool. Thank you very much for the article! I appreciate your work. I was surprised when I saw that I entered long right at the moment when you closed your profit short trade 🙂 And then my attempts to get short in the area where you had long bias. You asked who would be buying there and well… not exactly in the same area but I was looking for long trade from the support. Thats funny… Anyway the result of my trading here is +1 pip (after commision). But it is demo, I am still learning (as you can see all my trades are against yours 🙂 ), and your blog helps me a lot! Thank you! Thanks for your feedback. I’m pleased to hear that my writing is helping with your trading. It’s pretty cool how we traded almost exactly opposite positions in the area of this support level. And yet we both did ok as a result. Ultimately all we can do is take a position based upon our real-time read of the bias… cutting risk when we get it wrong and trying to maximise gains when right. We both did that. And while neither of us is retiring off this trade sequence, we both did ok and survived to move on to the next opportunity. Good trading all around, I say. Well done! Your articles are great and brings me back time and again. As I am having difficulty/dilemma in placing my stop-losses for entries I would like to learn more about this. would you mind sharing where would be an idle SL for the above entry and why ? The basic idea with stops is that they should be placed in the location where the premise is invalidated. That is, the point at which the whole idea behind the trade is in doubt. 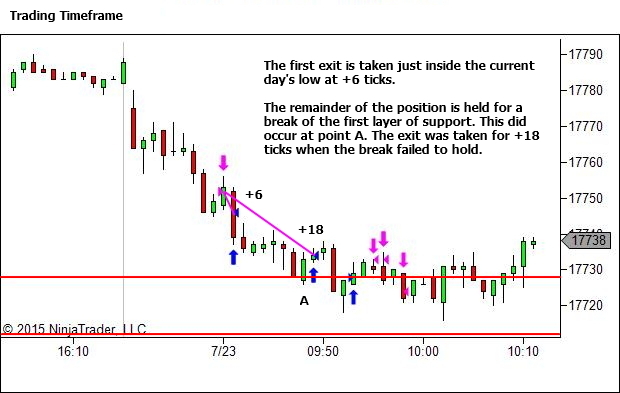 In this trade, the entry was based upon the rapid rejection occurring within the setup area. The stop would be a tick or two above the high of the rejection. If it gets back there, I read the sentiment wrong so I want out. I’ll then reassess and determine further actions. This may involve a second attempt at entry if subsequent information shows the premise still valid.